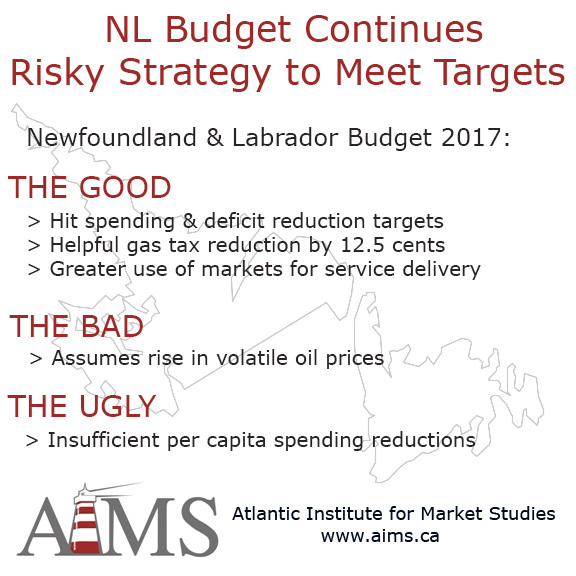 ST. JOHN’S, NL – The Atlantic Institute for Market Studies (AIMS) called on the Newfoundland and Labrador government to cut spending in Budget 2017. While there is some good news for consumers, the benefits are contingent on the risky strategy of hoping for an increase in oil prices and production. During her Budget Speech today, Finance Minister Cathy Bennett admitted that Newfoundland and Labrador has a spending problem. “The budget reverses the worst part of the province’s fiscal strategy, namely the gasoline tax hike from last year. This is good news,” said Ed Hollett, AIMS Senior Fellow for Newfoundland and Labrador, in response to Thursday’s budget. AIMS is Atlantic Canada’s only independent, non-partisan public policy think tank, providing a distinctive market-oriented perspective on economic, political and social issues. Unique among research organizations in the region, it does not accept government subsidies. The Institute’s research focus encompasses education, healthcare, education, trade and public finance.